Additional research and reporting by Marne Coleman and Austin Iverson. Our White Wine of the Year, also the winner of our Best Sauvignon Blanc category, from Woodinville-based Efestē, underscores the argument that Evergreen Vineyard, in the Ancient Lakes AVA, is Washington’s finest site for white wines. The name Feral refers to the wild yeasts used during fermentation. The result is a Sauvignon Blanc that hits just the right green notes, with grass and green papaya to balance grapefruit and mineral notes. Pairs With: Crab and green papaya salad. This marks three years in a row that Woodinville-based Morgan Lee has produced the winning wine in the $25 or Less Syrah category, an impressive achievement in a blind, multi-judge format. More impressive still: This $25 wine is our Red Wine of the Year (and also our favorite Syrah for less than $25; see page 78). It comes from seven vineyards scattered across four Washington AVAs, and it includes co-fermentation with a small amount of Roussanne. The core of pure marionberry fruit is complicated by savory threads galore: green olive, nori, and bacon fat, to name a few. Pairs With: Grilled lamb burgers with tomato jam. It’s back-to-back wins for Washington’s flagship producer in the good-value Chardonnay category. Winemaker Bob Bertheau and his team craft this wine mostly from the warm Wahluke Slope AVA, and the flavors tend toward riper stone and tropical fruits. Judicious use of new oak (35 percent) adds subtleties of vanilla and baking spice to a dry, balanced, attractive Chardonnay. Pairs With: Seared scallops with a sauce of reduced Chardonnay and butter. The grand master strikes again, with Bob Bertheau and his Woodinville-based Chateau Ste. Michelle team taking home wins in two of the three Chardonnay categories. This single-vineyard wine comes from 1973-planted Cold Creek Vineyard, one of Ste. Michelle’s crown jewels, and it was fermented dry and raised entirely in French oak, 61 percent new. The warm 2015 vintage shines through in the ripe, luscious, citrusy fruit, complicated by smoky oak and bready lees notes. This is rich, generous and ultimately delicious. Pairs With: A crab and corn chowder. Abeja Chardonnay has long been a benchmark white wine for Washington, and Walla Walla-based Dan Wampfler and Amy Alvarez-Wampfler keep the tradition going with this gorgeous vintage, drawn from a trio of vineyards scattered across the state: Celilo, Conner Lee and Abeja’s own estate Mill Creek Vineyard. Barrel tones of toast and nutty oak (this was aged for nine months in French oak, 40 percent new) swaddle a core of densely-packed apple and nectarine fruit. The seamless texture is seductive as can be. Pairs With: Black cod with lemon aioli. Walla Walla-based Gilles Nicault (in collaboration with German winemaker Armin Diel) takes his second prize this year (he also made our rosé winner, Julia’s Dazzle) with Long Shadows’ classic reference-point Washington Riesling, drawn from sites across the Columbia Valley. At 1.1 percent residual sugar, this wine walks a tightrope between dry and off-dry styles. The layered fruit (lime, tangerine, peach) is complicated by persistent minerality and balanced by a striking vein of acidity. Pairs With: A loaded baked potato, bursting with lardons and melted cheddar. Sparkling wine is in its nascency in Washington, with the scene still mostly dominated by the longtime winner in this category, Ste. Michelle Wine Estates, and Treveri Cellars. Nevertheless, we see more and more boutique bubblies popping up each year, and we intend to continue evaluating this small but quickly growing (and delicious) category of wine. Keith Kenison and his Prosser team make this lovely sparkling wine for 14 Hands, a winery that is among Ste. Michelle Wine Estates’ “string of pearls.” It includes traditional Champagne varieties (Chardonnay, Pinot Noir, Pinot Meunier), alongside a quartet of other whites: Pinot Blanc and Gris, Chenin Blanc and Riesling. This is an approachable bubbly, with lemon and apple fruit, and the generous dose adds a kiss of sweetness to balance the wine’s high natural acidity. Pairs With: Popcorn tossed with a mix of butter and chili oil. This year’s Winemaker to Watch, Woodinville-based Michael Savage, scores a win in the mid-range Syrah category with his single-vineyard offering from Red Willow Vineyard. This site, at the western edge of the Yakima Valley, boasts the oldest commercial Syrah plantings in the state, planted in 1988, but Savage is working with a much younger block—mere 3-year-old vines—and harvesting quite early, such that the finished alcohol (12.4 percent) is considerably lower than most Washington Syrahs. The result is a brisk, refreshing red, brimming with fresh red fruits and exotic spiced meats. Pairs With: A mixed plate of salumi and charcuterie, hard cheeses and olives. Upland Vineyard in the Snipes Mountain AVA is proving quite adept at growing Rhône varieties like Grenache and Syrah, and Ryan Crane’s version of Upland Syrah (co-fermented with 6 percent Viognier) for SoDo-based Kerloo Cellars is a brilliant example. The complexity here is off the charts, as notes of berry and flower and meat and mineral interweave harmoniously. Crane is a master of texture, and his Syrah manages to convey wonderful intensity with its moderate (13.7 percent) alcohol. Pairs With: A beef-and-lamb gyro studded with pickled cucumbers and beets. L’Ecole No. 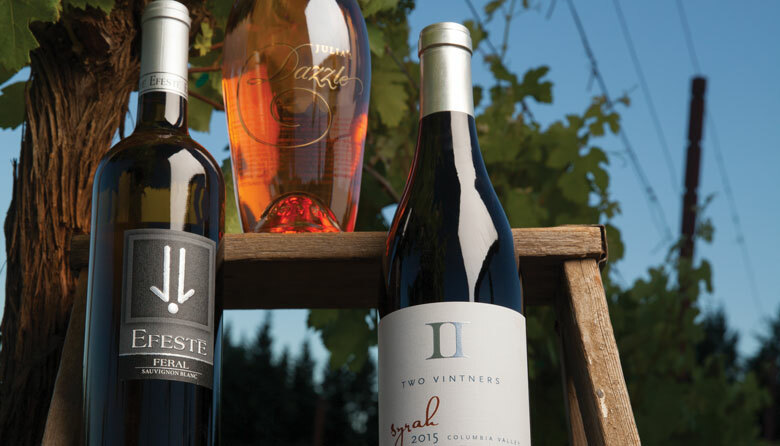 41 is a stalwart winery of the Walla Walla Valley, with a track record of consistent excellence. Marty Clubb and Mike Sharon source Merlot (along with small amounts of Cabernet Franc, Malbec and Petit Verdot) from 10 vineyard sites scattered across Washington and masterfully blend them into a balanced package bursting with black cherry fruit, mocha and violets. Finishing tannins are fine-grained and polished; this is classy Merlot indeed. Pairs With: Peking duck. Winemaker Jean-François Pellet makes it two wins in three years for Walla Walla-based Pepper Bridge in this category. The wine includes portions of Cabernet Franc (15 percent) and Malbec (7 percent), and it comes from the winery’s estate vineyards, Pepper Bridge, Seven Hills and Octave, all in the Walla Walla Valley. For many vintages, Pepper Bridge’s Merlot is an imposing beast that takes years to unwind. Not so for the warm 2015 vintage, which offers loads of pleasure up front in its densely packed layers of black cherry and fig fruit. Pairs With: An herb-crusted pork rib roast. Consistently one of the finest Cabernet values produced in Washington, Rich Funk’s Walla Walla Cabernet for Saviah Cellars (also in Walla Walla) comes from McClellan, Anna Marie, and Dugger Creek vineyards, blended with 13 percent Merlot from Seven Hills. The Cabernet flavors are clear—cassis, beetroot and earth—and they’re framed beautifully by nutty oak notes. Pairs With: A Philly cheesesteak. Walla Walla-based Tranche, sister winery of Corliss Estates, is focused on estate vineyard sites, including Blue Mountain Vineyard, the source of this lovely Cabernet. As with all the reds in the Corliss/Tranche family, this is notable for its extended bottling time, which adds complexity and allows tannins to soften. Blackberry and blueberry fruit is shot through with persistent mineral streaks and framed by fine-grained, rapidly integrating tannins. Pairs With: Portobello burgers topped with roasted peppers and slathered with miso mayo. Woodinville superstar Betz Family Winery takes the coveted high-end Cabernet prize this year for its 2015 Père de Famille, crafted under the direction of Bob Betz and Louis Skinner. Cabernet Sauvignon comprises 87 percent of this wine, the remainder being Petit Verdot and Merlot, sourced primarily from Red Mountain. This powerful red is a melding of blackcurrant fruit with subtleties both herbal (bay leaf, rosemary) and savory (black olive). Pairs With: A fat slab of prime rib with roasted potatoes and braised greens. These wines are blends made up of small proportions of a number of different red grape varieties. Typically, no one variety makes up more than 75 percent of the blend. price point. Pairs With: Oxtails braised in red wine and stock. The Walls, based in Walla Walla, is one of the most exciting new wineries to launch in Washington for the past few years. To wit: this blend, for which winemaker Ali Mayfield begins with 79 percent Portuguese varieties—Touriga Nacional, Souzão,Tinta Cão, Tinta Roriz (a Tempranillo clone)—and blends in 21 percent Cabernet Sauvignon. The result is an exotic mix of spice (star anise especially) and citrus peel, plum and violet. It’s a singular Washington blend, intellectually and sensually provocative. Pairs With: Feijoada, the Portuguese/Brazilian stew of pork, beef and beans. Chris Upchurch honed his reputation as the winemaker for DeLille Cellars. His own wines, under the Upchurch label, come entirely from his estate Upchurch Vineyard on Red Mountain. The 2015 vintage was the inaugural for Counterpart, a blend of 65 percent Merlot and 35 percent Cabernet Sauvignon, aged entirely in new French oak. Black cherry and black plum fruit are complemented by barrel tones of chocolate and spice. The rich fruit is framed nicely by robust, chewy tannins. Pairs With: A medium-rare New York strip with a root vegetable gratin. A Rhône blend combines varieties typically found in the Rhône Valley of France, most notably Grenache, Syrah and Mourvèdre, but sometimes include Cinsault and Counoise. College Cellars is the teaching winery attached to Walla Walla Community College’s Institute for Enology and Viticulture. The Class of 2017 crafted this Rhône-style red, a blend of 45 percent Grenache, 37 percent Mourvèdre and 18 percent Syrah from two vineyards: Cockburn Ranch in the Walla Walla Valley and Inland Desert in the greater Columbia Valley. The Grenache shines through with notes of brambly berries and dried herbs, and the texture is lovely here, supple and seamless. Pairs With: Pork mole enchiladas. Kevin White’s Rhône-style blends for his eponymous Woodinville winery (our Best Emerging Winery this year) are fantastic values, year in and year out. The 2015 Fraternité is 60 percent Grenache, 33 percent Mourvèdre and 7 percent Syrah, and it comes from two stellar vineyards: Upland on Snipes Mountain, and Boushey in the Yakima Valley. Despite the warm 2015 vintage, this wine dazzles with the purity and freshness of its red fruit flavors and floral tones. It drinks like liquid silk. Pairs With: Polenta cakes smothered with garlicky sautéed mushrooms.